We are pleased that our Goodman’s Fields scheme has been nominated for the 2018 24housing awards. A ceremony to reveal the winner will take place in Coventry in October. 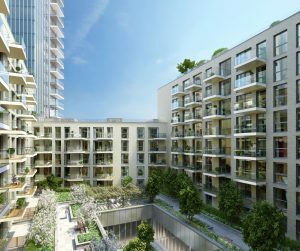 Built in conjunction with Berkeley Homes, this large development sits in the heart of central London – in Aldgate, Tower Hamlets. It consists of 119 rented and 52 Shared Ownership units. The construction work is already well underway, with some of the homes already built and the remainder due for practical completion by the end of 2019. The Shared Ownership homes are already available to reserve. Just visit our dedicated sales website – newlonliving.co.uk.